2006 Walk of Ideas, Berlin, Germany. This would be proven experimentally by Cockcroft and Walton in 1932, when they developed the first particle accelerator and used it to smash protons into a lithium target to produce alpha particles. They had split the atom. Six years later nuclear fission would be discovered. The original Cockcroft and Walton experiment. and converting some of its mass to energy. In 1939, the Austro-Hungarian physicist Leó Szilárd would approach his old friend and cohort Einstein with a letter which he intended to send to President Roosevelt. 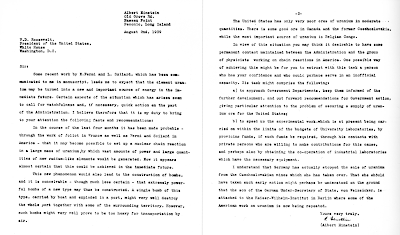 The letter was an attempt to convince Roosevelt that the U.S. should begin research on creating an atom bomb, fearing that the Nazis—who were trying to develop just such a weapon—would get the bomb first. Szilárd wanted Einstein to lend his fame and credibility to the proposal. Einstein signed the letter and it resulted in the creation of the Manhattan Project. Both Einstein and Szilárd would come to regret that letter. They were against using the atom bomb against civilians and thought that simply demonstrating the power of the bomb would be enough to force Japan’s surrender. After the war, Szilárd was so horrified by atomic weapons that he gave up physics for molecular biology. 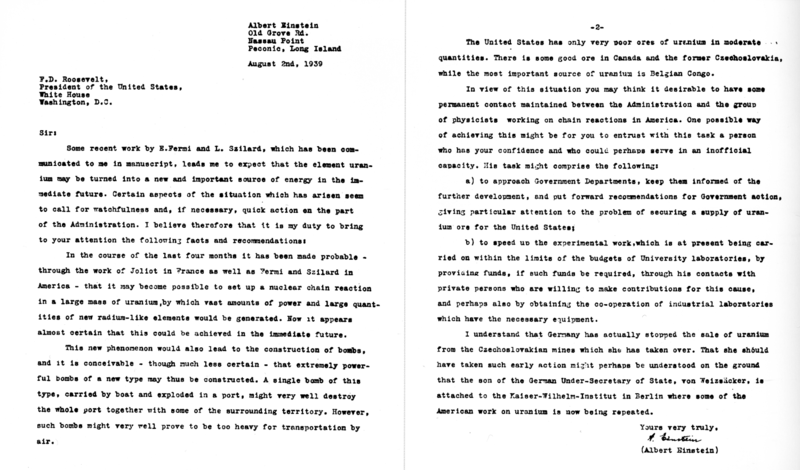 The Einstein-Szilárd letter that was sent to President Roosevelt. In 1950, Szilárd proposed a new kind of bomb using cobalt. The proposal was not meant to be taken seriously as a weapon, but as a wake-up call to point out that it would soon be possible to destroy all life on Earth. Ironically, Szilárd was diagnosed with bladder cancer in 1960 and underwent cobalt therapy that he himself designed. The cancer returned two years later and he was forced to undergo a second round of treatments with an increased dosage. His doctors thought that the increased radiation would kill him, but he disagreed and thought that it was his only chance to beat the cancer. The increased dose did end up working and his cancer didn’t return. This became the standard treatment for many forms of cancer and is still used today when more modern methods are unavailable. Incidentally, E = mc2 is just part of Einstein’s equation, and only describes the energy of an object at rest. The full equation is E2 = (mc2)2 + (pc)2, where p is the momentum. If the object is at rest then it has zero momentum and the equation reduces to E = mc2. If the object is a massless particle like a photon, then the equation reduces to E = pc, which means that the energy of a massless particle is equal to its momentum multiplied by the velocity of light.